Growing up, when my friends and I would imagine our own stories in the playground, or each others’ back gardens, there would invariably be goodies and baddies. Baddies were often witches or wolves or the cowboys in black hats and there was generally some dispute about who got to play which part, because although playing the baddie was often more fun, you knew that in the end you would be vanquished. Now we are grown ups, and when we talk about stories we talk about protagonists and antagonists. This partly reflects our interest in the mechanics of storytelling and our understanding that – in the most simplistic terms – the protagonist is the person we are being asked to get behind – who they are and what they want – whilst the antagonist is there to try and stop them getting it (even if they don’t do this on purpose). It also, though, takes some of the judgement out of the story. Who are we to say who is good and who is bad? 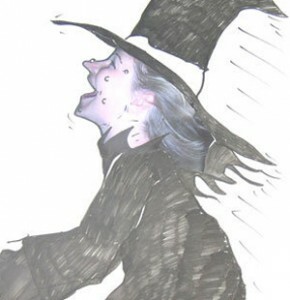 If we take the time to empathise with the witch, maybe we’ll see things from her point of view (see Wicked). Be they redeemable or not, a story without an antagonist is not a story. Imagine Neil Gaiman’s ‘Fortunately the Milk‘ if the dad just went to the shop, bought the milk and came home again. But the presence of one antagonising force after another amplifies both the ‘struggle’ and the story. When the protagonist gets into conflict with the antagonist, the protagonist’s character grows, usually to become stronger and wiser. Inadvertently, the antagonist has somehow cause positive change. Antagonists stay as antagonists because this is not their story. No matter what they want, this not their narrative. In the era of making ideas ‘go viral’, the antagonist plays a vital role in propagating any kind of narrative. Now, because it is so easy to do with just one click, people actively share stories that they disagree with. The result of this? Extending the reach of the original message whilst having no counteracting effect on it at all. By latching on to a narrative we disagree with, and effectively becoming the antagonist to that story, we are giving it power and in some ways validating it. By taking up the term fake news, for example and turning it against those who use it to spread lies and propaganda, we accept and authenticate that narrative. If on the other hand we were to reject it outright, and focus on the need for transparency in positions of office and for excellent journalism, we make our own, more powerful story. By telling those whose narratives are bigoted or racist or sexist that they are wrong, and getting vocally angry with them, we are behaving exactly as they expect us to do, and we are fuelling their fire. In their story, we are the antagonists who their supporters love to hate. By instead creating our own narratives of equality and human rights, we create our own sympathetic protagonist that others can get behind, and hopefully our story, in the end, will be more powerful. This is not to say, of course, that protests or resistance, are useless. Of course not. But successful movements always start not by playing the antagonist, but the protagonist, and defining the positive outcome that they seek. Good call. The concept of the antagonist being a losing force runs right through our culture, including government — “opposition party” etc. All success stories claim their own narrative. Have you and the girls seen Maleficent, by the way? Narrative reclaimed.